Sunny but cold | Carnahan & Sons, Inc. The sky is a brilliant October blue. The temperature is about 50ºF. Ben has delivered two loads of corn, by appointment, to GPC at Washington. Nick is out there washing the white Mack truck we call ‘Vanna’. Yes, it’s chilly, but a vastly better day than yesterday, when we had no sunshine, and the wind was blustery and cut-through-your-jacket chilly. With a calm wind today, it just feels much better. Hopefully, Nick can get the JD 9360R tractor and grain cart cleaned, too, this afternoon. Mr. Worland has completed many days of conservation repair work at the home farm and at the Steen farm near Wheatland. He has built some new WASCoBs, cleaned the silt from others, built some ‘rock chutes’, and filled in the gullies of erosion created in the excessive rain events of spring/summer ’13. Next Monday, we will plant wheat on those strips to protect the repair work over the winter. The vegetative growth it provides now will aide the protection of the soil not only this winter, but also all next summer. The wheat will be stopped with next spring’s first herbicide treatment. 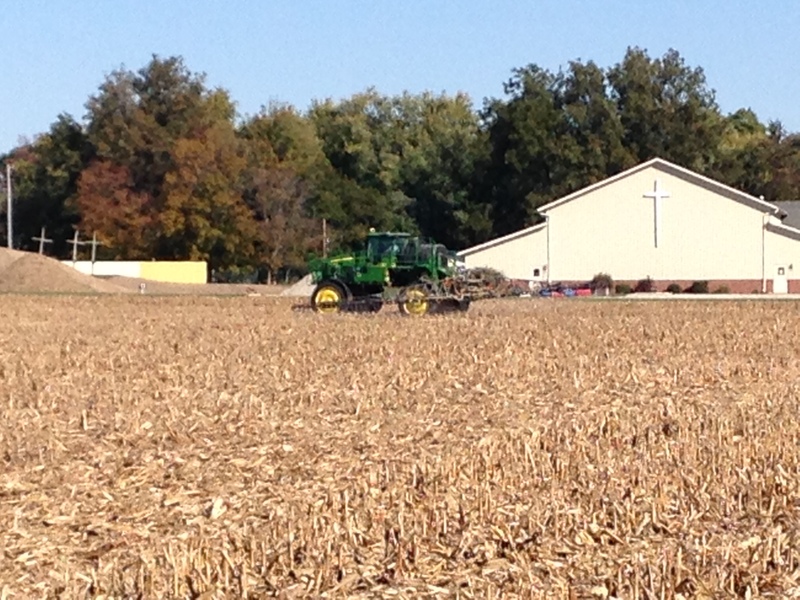 John is near Wheatland spraying a fall herbicide treatment on the corn stalk fields there. He is applying Roundup (glyphosate) + Rifle (dicamba). He should get all the fall spraying ‘caught up’ by this evening. Ross and Rhoda are in Ohio this week for the Quarter Horse Congress. It is a vast, well-attended competition event… one of the highlights of his year. I calculated the acres of replanted soybeans (159.17) plus double-crop soybeans (520.4) that remain to be harvested. I check them frequently as to their progress toward maturity, and I’m beginning to think that old adage about a ‘watched pot’ is very true. I would think that the freezing weather would stop any growth, and that it would accelerate the drying process. But the colder temperatures are not as conducive to drying as the 70 and 80 degree days of September. Looks now like those will not be ready (dry at 13% moisture) until November. It’s sure hard not to be harvesting on a beautiful day like today… when we know that days like this are often rare in November. However, we have never failed to bring in the crop… and our Maker will provide what we need. This entry was posted in Farm Days, Harvest, News and tagged DCB, dicamba, double-crop soybeans, glyphosate, GPC, grain cart, JD 9360R tractor, Roundup, Wheatland Indiana. Bookmark the permalink.